The first step in a successful project, other than how it supports strategy, is to sell the project throughout your organization – up front and often. Once it’s fully supported and underway you’ll want to continuously promote progress and keep the team inspired. Here are a few ideas to create awareness of your project and keep momentum. Get on the agenda of departmental meetings and talk up your project. Give the project an unfamiliar or catchy name that piques curiosity. Put a large project chart somewhere visible, near the team, and mark it up to show progress. Have team offsite meetings where you can focus only on the project (phones off!). Get items printed with the Project Logo – like coffee mugs or tee shirts. Have a Project Launch! – but not too soon – and only one. Get logo stickers printed for the team’s laptops. 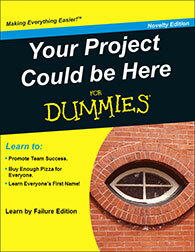 Make 4 Dummies book covers and use for in-progress team awards. Celebrate early failures as learning experiences. Don’t be punitive. Use any excuse for food and beverages – often. Make progress updates in a company newsletter or blog. Start a project blog. Speak about the project at a conference (great for recruiting, too). Promote the fact that team members got some time off after the project crunch. Then – everyone will want to join your next project. If you promote your project enough and recognize your team’s contributions you will have a line of people wanting to join your team. Please let me know what ideas have worked for you for promoting projects and getting the best people on your team. Thanks! When are enough requirements enough? Is the minimum viable product enough? How do we get it right for initial launch and then put an iteration plan in place?